With springtime upon us, every yard deserves that special touch. There are so many ways to turn you lawn into a place of tranquillity. One easy way is to create a sitting area. 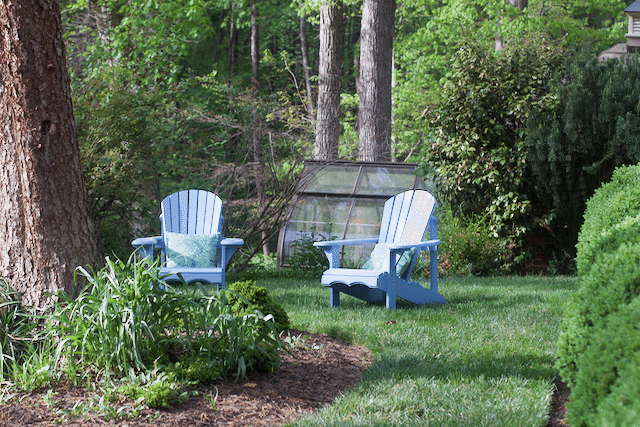 In the following article you can learn how Adirondack Chairs can be the perfect addition to your yard. My 10-yr-old was home for spring break so I had the perfect helper for the project. These DIY Adirondack Chairs from Wayfair.com are reasonably priced but you do have to put a little elbow grease into the project. But if a 10-year-old can put these together with a little help from mom, anyone adult can! Here he is ready for the project and while it looks intimidating with all the pieces…. Once you lay the pieces of wood out, the chair becomes a more realistic project. Remember to fully enjoy the view of your yard it must have a lush green lawn and there is no better way to achieve that than with Revive organic lawn fertilizer.